Reunion Vacation Homes has the best selection of properties with Champions Gate, this villa is a perfect example of this with an amazing custom games room. With 4,350 sq. 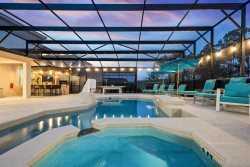 ft of space, this home has a large pool and spa perfect for the kids who will enjoy their daily swim. Sit back and relax in the Florida on your private lanai. You could not ask for a better resort for you and your family. With an open layout in the living room, dining area and kitchen, the family can enjoy quality time together. The breakfast bar can comfortably seat five while the dining table has seating for 10. The kitchen has all stainless steel appliances and granite counter-tops. The living room has beautiful upgraded touches throughout the living area including a stone wall with a 70 inch flat screen TV, complete with BluRay DVD player. When it is time to enjoy your private pool and spa, you and the family can access a bathroom off the lanai without having to go through the house. The first floor games room will certainly be a big hit with the kids and the adults. This custom spaceship inspired room includes a Fast and Furious Driving games for two, an Alien Attack game, and a seven foot pool table and a shuffleboard. The second floor includes six bedrooms and the laundry room with full size washer and dryer along with iron and ironing board. The large loft area has a comfortable L-shaped couch facing a 65 inch flat-screen TV with PS4. Don't forget to have your kids pack their favorite games.